Over 25 years of service serving the paint and powder industry throughout North America. 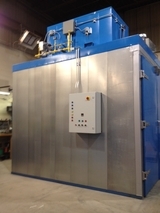 Process Equipment has been engineering and fabricating ovens, washers and paint booths for over 25 years. We provide you with innovative and cost-effective products to meet your heat or coatings process requirements. Contact us now for a quote on the product you need. Our head office and fabrication facility is located in Cobourg, Ontario and serving clients throughout North America. Call us today for a free estimate and find out what strong, industrial-strength engineering can do for you and your clients. Process Equipment division dedicated to wood and cold formed steel panel equipment.